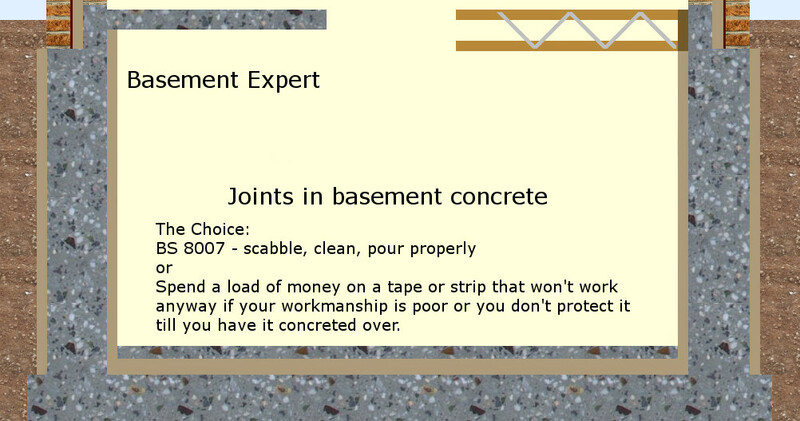 Tapes, strips and bars in joints do nothing in joints properly formed to BS 8007. Neither can they perform a miracle if the workforce chucks them or the concrete in any old how. A good tape or strip will only overcome slightly poor workmanship - the odd mistake. As a precaution they have their place. At the end of the page a word about cold joints, day joints and so on. 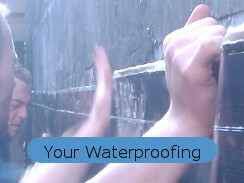 But they are very difficult to fix down properly, protect from damage, keep dry and keep clean. And the concrete either side has to be sound for a joint not to leak. The first 3 photos show different hydrophylic tapes that expanded prematurely because it rained before the formwork was complete. Glued down in a rebate they tear themselves off. Extra money spent on a multi material strip in a steel cage, just as uselss despite huge cost. The fourth strip is clearly not in proper contact with the kicker concrete and the kicker clearly has voids at the bottom where there is no strip. All useless. The last photo shows a wall filled to the top in one go so the concrete at the bottom is segregated. The holes can be smoothed over with cement and silver sand but that joint could never be waterproof without removing all the voids both sides and replacing with a waterproof sharp sand concrete, which is exactly what I did back in 2005. It took 2 weeks. If a tape or a strip is fixed without supervision there is a likelihood that the workforce will chuck it and the concrete in leaving voids inches away from the tape where it cannot do any good. If the kicker beneath the tape leaks or the bottom of the wall concrete is honeycombed you still have a leak even if the tape works. The best of a bad bunch, in my opinion is this product: Fradiflex metal water stop from Max Frank. Fradiflex has two wide peel off tapes. After fixing it to the top mesh and just before you concrete you peel off the bottom tape to expose the painted surface that the slab concrete bonds to. 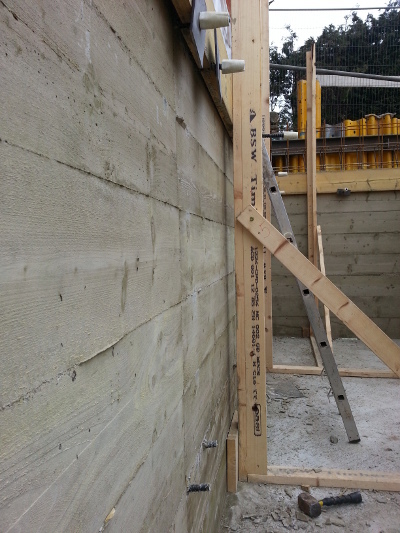 Then at the last moment before your wall formwork goes up you peel off the top tape so that the wall concrete will bind to the steel strip as well. Clearly unaffected by any rain, unlike anything hydrophylic that will swell early and ruin. Kept clean for most of the time and still cleanable after that. Does not fold over when the concrete goes in like rubber waterstops tend to, as well as being far less labour intensive. But it has to be used properly. Ends lapped as they should be. None missing. I have known it fail when overlaps weren't formed properly and when the protective strip wasn't taken off. The Standard expects the joint to be Properly Made. Particular care should be taken to ensure that the new concrete close to the joint has an adequate fines content and is fully compacted. The surface to be bonded to needs to be scabbled. 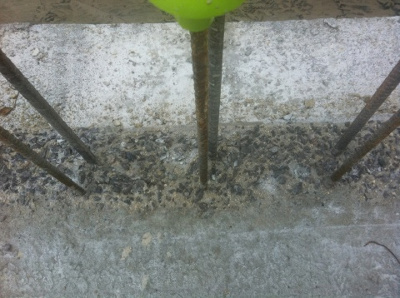 This concrete was sprayed with retarder an hour or so after the concrete was laid. It was washed off with a jet wash before the men left that day. This is a mechanical scabbling tool powered by an air compressor. The problem, compared to spraying retarder and washing it off, is that this tool cannot get under obstructions. However it will still work if the concrete has been left to harden a day, a month or a year. You can see that a wide, continuous strip has had all the surface removed and blown clean with the air compressor. 32m of perimeter took less than 2 hours to scabble properly. Creating aggregate interlock is easy with a bit of planning. Having cleaned the surface, it has to be kept clean. My advice is a thoroughly good blow out with an air compressor every day. 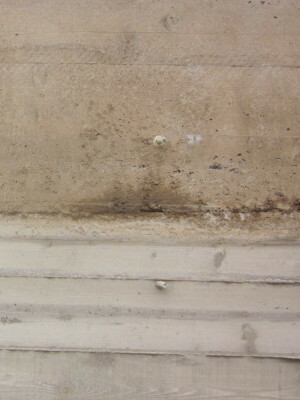 When you have wall formwork covering the joint, make provision for the dirt to escape through a hole you can patch over. That means delivering the concrete to the bottom properly and compacting it properly as well. If concrete is released from the pump at the top of a 3m high wall it crashes past every horizontal reinforcing bar spraying everywhere inside. 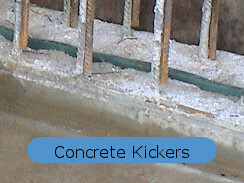 The first concrete delivered loses cement and water to the inside faces of the formwork and the stones fall to the bottom without enough slurry around them. That's all that it took to create this problem. Concrete is not delivered to site like this. Rice Crispies / honeycombing at the bottom is something the workforce created. It is simply and only poor workmanship. If you use these 2 simple remedies you should never get honeycombing again. 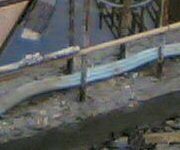 Use the pipe to direct the concrete safely past the steel. 2. Only form and pour walls to half height at a time. It isn't really any more labour intensive, firstly because forming half height takes half as long, and secondly because you will have so much less concrete to repair afterwards. 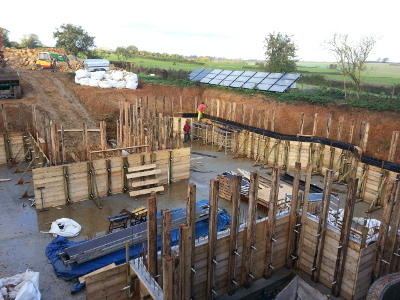 Half height formwork means it is far easier to get concrete to the bottom properly. It is also far easier to get the poker to the bottom easily. Any more than 2m deep and a poker is curling and getting knotted up in the steel - instead of compacting the lowest layers. 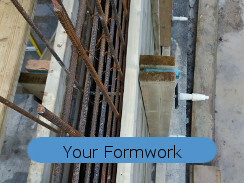 You might not need to buy or hire as much formwork either. 3. Reinforcing steel sufficient to control cracking. There need to be enough starter bars through the joint to control cracking when one element cools against the other. I share my experience of how much steel is necessary on the page for structural engineers to read. Same concrete. Same formwork. Different workforces. Cold joints in concrete can differ. Waterproof concrete is much less prone to a cold joint, see below. Despite the form failing our inspection and the workers spending an hour trying to clean mud out, they did not get the first concrete properly clean back to aggregate. So the second concrete did not bond to the first and a few weeks later the joint was leaking. All of this concrete was properly placed and compacted. All surfaces to be bonded to were cleaned with a needle gun then blown clean. None of this concrete ever leaked. What is a cold joint? Well, it hasn't got much to do with being cold. Wetter than it needed to be perhaps, but not being cold. This is what the UK's Concrete Society have to say. What this is explaining is the accidental joint caused, for instance, because a concrete truck was delayed and earlier concrete had stiffened too much to be pokered when fresh concrete was placed on top. Is it directly at odds with this quote from BS 8007? BS 8007:1987 Code of practice for design of concrete structures for retaining aqueous liquids states that Waterstops should not be necessary in properly made construction joints. The British Standard is saying that two pieces of concrete, cast days, weeks or years apart, will self-seal if the joint is properly made making the assertion by the Concrete Society that full knitting together of the two batches of concrete under vibration to form a homogeneous mass is not always necessary. No they are not at odds. 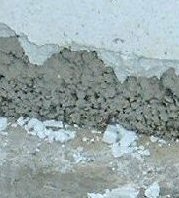 The Standard is saying that if poor concrete, called laitance, is removed from the first concrete then the second concrete will bond to it no matter how old the first is. The Society is only defining what a cold joint is. They might have gone on to say, clean the first concrete with a jet wash before the second is placed. Ordinary concrete contains more water than necessary to make it workable. 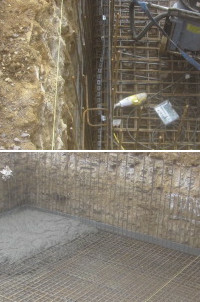 If one load is put into a wall and there is a substantial delay before the next load is put on top then the first concrete will settle and water and cement will rise to the top forming a scum on the surface. It is this scum called laitance that is usually mixed in to prevent a cold joint. In the Concrete Society's definition what they are describing is that after a delay the new concrete settles on top of laitance from the earlier delivery and that joint will not bond. 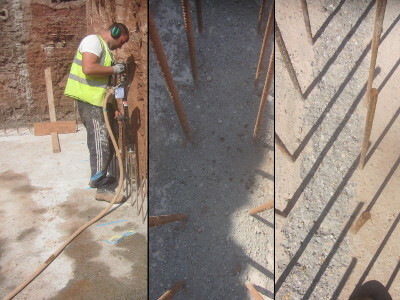 The concrete specified by the Standard has less water so settling and laitance are less, but the Standard is not referring to concrete poured on the same day. Concrete that has had a chance to properly set and harden before more concrete is cast upon it can be scabbled first, that is, any laitance removed. Then the new concrete simply bonds with the exposed aggregate as if it was one piece of concrete. The only other issue that would normally remain is heat shrinkage as the new concrete cools and that should be controlled by sufficient reinforcing steel through the joint. Waterproof Concrete with my powerful plasticiser will be very workable yet have a very restricted water content. Therefore your concrete will not settle after compaction and you will not get a cold joint after 5 minutes, 5 hours, 5 days or 5 weeks. Though if it rains while the concrete is setting that will create laitance. Concrete is crystals that are long and thin like pencils that knot together. As a layer of a grain of cement powder is hydrated and changes, many crystals are produced, and many more from the next layer, and so on. As the cement hydrates it first expands into a gel. Throughout the concrete the gel is forced into available space but on the surface, and only on the surface, the gel can expand freely raising the surface and all the cement will hydrate into crystals poking out randomly. So they are molecular in size and what is glass smooth to us is rough and a good key to more crystals from the next concrete pour, gel within which will be forced into the gaps between the crystals on the surface of the first pour. As long as what they need to bond to is good concrete or aggregate then the bond will be complete. The best way to avoid an accidental cold joint is to use waterproof concrete.